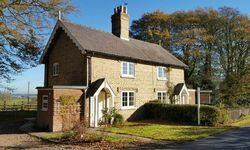 Ideal for escapism and exploring rural and coastal Lincolnshire. 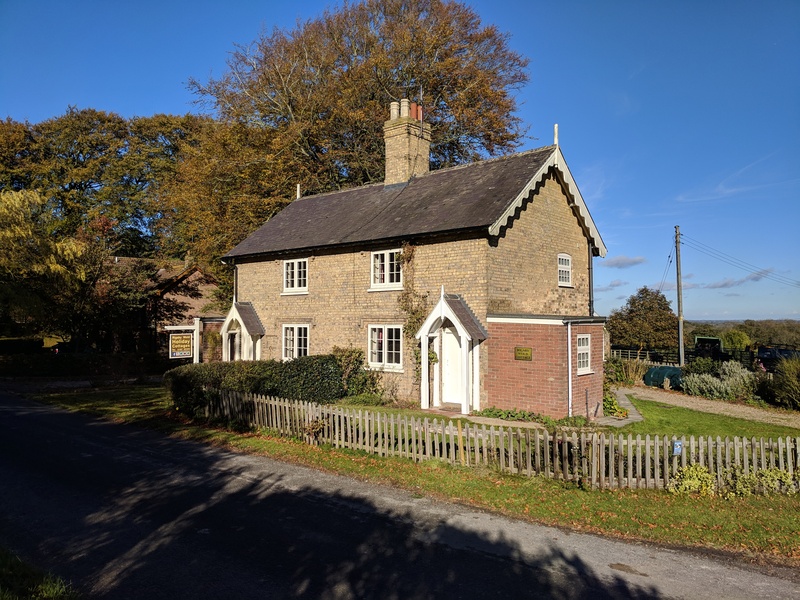 The cottages are a pair of roadside cottages in Rigsby, adjacent to the access to Rigsby House and Rigsby Church. This is a quiet wood side spot with only one other property on the road side. The farmstead is 200 metres beyond. Access is from the gravelled drive, with sufficient private parking for two vehicles. There is ample room for reversing, before rejoining the highway. There are two steps up to the double glazed and heated entry porch, this opens onto the kitchen/diner and to the lounge beyond. Level access can be obtained from the door on the front elevation, if desired. This door opens directly onto the upstairs footwell, with doors off to the left and right to the lounge and cloakroom respectively. The stairs to the upper floor are steep but straight, typical for a country cottage, with a handrail on the left side. These open onto an upper foot-well, with one further step into the bathroom beyond, or onto an access corridor to the two bedrooms. A grab rail is provided for your convenience and a nightlight is plugged into an adjacent socket to highlight this step, should you wish to use the bathroom during the night. The bedrooms, access corridor, upper foot-well and lounge are fully carpeted. The bathroom, lower foot-well and the cloak room have Vinyl flooring. The kitchen, dining area and double glazed porch have laminate flooring. Care must be taken if this type of flooring gets wet. Smoke alarms are fitted on both floors and a fire extinguisher and fire blanket in the kitchen. Emergency escape is via either door, or via the casement windows to the front elevation. Windows on the side and rear elevations are double glazed. The garden area is reasonably level, save for one grassy hump, the remnants of an old beech tree and a slightly raised paved pathway from the front to the rear doors. A rear courtyard is concreted and may be slippery if covered with beech tree leaves in the autumn or when wet. 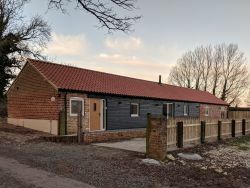 The Stables is an early 1800 barn converted to a holiday accommodation 2018/19 according to modern building regulations. Parking for two cars is available, with one of the car parking places giving level hard standing to a wheel chair friendly ramp giving access to the property. Is via a shared, sloping (less than 25 degree gradient), tarmacked drive off Haugh Lane. Parking for two cars is available, the first on private level concrete hard standing at the front of the property, the other on sloping tarmac (also less than 25 degree gradient) at the side of the property, which is adjacent to the shared drive and at a 90 degree angle to the first parking space. The first parking space is parallel to the front of the property, where there is also ramp access to the Front Door. This standard access ramp is 4.4m long with a 1:12 gradient. The second parking space is approximately 10m max from the Front Door, which can either be accessed via the aforementioned parking space & ramp, or via a gravel path that borders the property's perimeter. The Front Door is 840mm wide and has a minimal threshold change into the Boot Room entrance. There is external lighting to the front and rear of the property that is motion detecting when turned off. The property is single storey barn conversion and has no level changes between rooms. The flooring is luxury vinyl tile from Floors For Paws, which is hypo-allergenic, slip resistant & pet friendly. There are no rugs inside the property. Internal doors are approximately 810mm wide. All sockets are at disability friendly at a height of 560mm off the floor. Boot Room - Generous free floor space. Door mat against Front Door. Kitchen/Lounge/Dining – One large open-plan room. The Kitchen area has a low-level fridge, dishwasher and electric oven. There is a vitroceramic hob and microwave. All units are standard height. Utility Room - with Washing Machine and low-level freezer with minimal floor space between galley style units. Bedroom 1 – There are no large areas of free floor space around the king size bed, min gap between bed and furniture is approximately 900mm. Bed room 2 – Free floor space is minimal around the two single beds. Bedroom 3 – Free floor space is minimal around the two single beds. Bathroom and WC There is a family Bathroom off the passageway, comprising shower over bath, sink and toilet. Approx 1860mm x 1800mm max open floor space. Also there is an En-suite off the Master Bedroom, with enclosed shower cubicle (250mm high step at entrance), sink and toilet. Approx 1850mm x 580mm max open floor space. Both door locks can be released from the outside in an emergency. The Front Garden is approached either from the Front Door via standard access ramp, or via two sets of French Doors onto the Patio area, with two steps each down (max step depth 270mm from Lounge/ 290mm from Master Bedroom). This space is enclosed with a concrete base 16m long x 5m wide. To the rear of the property is a grassed area (as of February 2019 not yet established) which is not enclosed. This is accessible from a gravel path to the side of the property, adjacent to second parking space, with a 13cm step down onto a further gravel path. There is less than a 10% gradient to climb from the gravel path to the grassed area. Nearest rail link is: Lumley Square, Skegness, Lincolnshire, PE25 3QL (managed by East Midlands Trains) Nearest bus link is: Call Connect On Demand Public Bus Service Tel: 0345 2343344 for information/to book. Perfect location, lovely cottage, great hosts. Wish we could have stayed longer. Highly recommended! We enjoyed a relaxing short break in this very cosy cottage. Explored the local walks and beach at Anderby Creek, Sunday lunch in Aby. Very please we found this great spot. Thank you. Everyone was a winner on our 1 week break: beach, castles, biking, beer etc what not to like about Lincolnshire and its people. It was like going back in time to the 70’s before pound shops, Tesco plc, globalisation, Euroland and all that jazz, alas back to smelly old London and M25...we will be back to get our fix! A peaceful and relaxing spot; quintessential England. Lovely cottage and people too, with lots to see and do. Cosy, clean and comfy. Enjoyed views, magical churchyard. Bluebells in Rigsby Woods, birds and flowers - delightful. Belle lovel running wild on the beaches. She would have loved a gate on the drive to keep her safe. ’The White Hart’ in Tetford - wonderful. Thank you for a good short break.